Cedar Rapids, IA, September 10, 2018 – NewBoCo continues its investment in Iowa’s entrepreneurial and nonprofit community by accepting four startups into Iowa Startup Accelerator’s 2018 Fall Batch. In addition, the Social Good Accelerator has accepted two nonprofits into its Inaugural Batch, after a successful pilot of the program earlier this year. Iowa Startup Accelerator is an intensive program that matches tech-based startups with world-class mentors, Midwestern work ethic, seed funding, and product development expertise to accelerate their business to a successful exit. 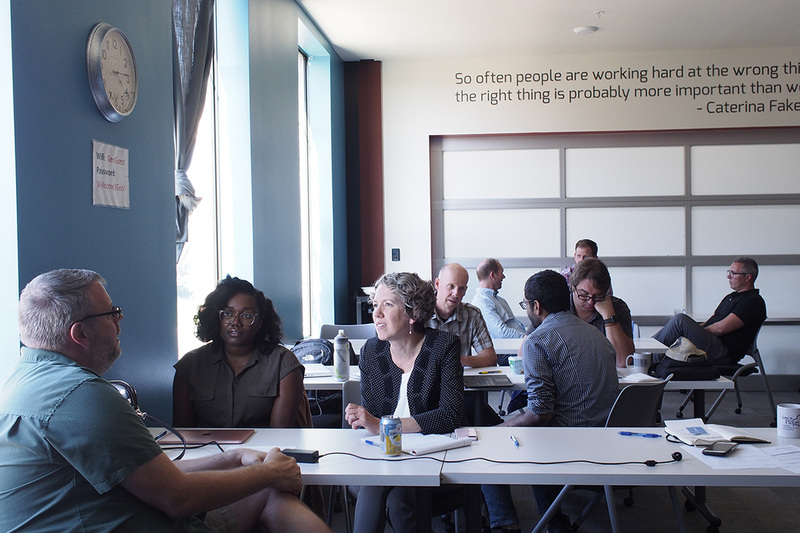 Nonprofits receive the same training and mentoring as tech startups. NewBoCo Executive Director Eric Engelmann returns to lead Iowa Startup Accelerator after a nine-month sabbatical where he toured startup and tech communities across the globe, including Singapore, Japan, and London. The New Bohemian Innovation Collaborative (NewBoCo) is a 501(c) (3) organization located in the New Bohemia neighborhood of Cedar Rapids, Iowa. NewBoCo’s programming supports entrepreneurship, innovation, and tech education to help Iowans become more resilient and thrive in a changing economy. ISA Portfolio updates: GOVRED Technologies has landed more than $100,000 in contracts. Cargofy has been selected as an exceptional startup in Mobility & Transportation at TechCrunch Disrupt San Francisco as well as being ranked #822 on the Inc. 5000 for 2018. Three teams have been accepted into their second accelerator program: Noviqu (Techstars Kansas City), Bytable Foods (Colorado Springs-based Exponential Impact), Codemoji (Virginia-based Lighthouse Labs). Description: 6C Solutions builds analytics applications that increase the profitability and productivity of chemical plants. Description: Class Composer is an online tool to help elementary schools make better student placement decisions. Description: Ranitzo is a targeted drone sprayer company focused on solutions that directly addresses the field needs of farmers and agricultural businesses. Description: High schools and colleges across the United States are increasingly seeking real-world experiences for their students. Project BBQ is a web-based learning management system that tracks these experiences, including student outcomes, real projects, and community partners. Description: Aging Services, Inc. is a regional, non-profit organization that provides services and resources to help older adults remain independent. The Linn County Senior Center will be a program of Aging Services. Description: Kids First Law Center, established in 2005, is dedicated to helping children in conflict. Kids First provides legal representation for children in high-conflict divorce and custody cases, leads divorce workshops for kids, offers no-cost mediation for separated parents, and helps parents peacefully exchange their children. The Youth Peace Project is a restorative justice program that helps kids learn to resolve conflicts peacefully at school. The New Bohemian Innovation Collaborative (NewBoCo) is a 501(c)(3) organization located in the New Bohemia neighborhood of Cedar Rapids, Iowa. NewBoCo’s programming supports entrepreneurship, innovation, and tech education to help Iowans become more resilient and thrive in a changing economy. Iowa Startup Accelerator is an intensive program that matches tech-based startups with world-class mentors, Midwestern work ethic, seed funding, and product development expertise to accelerate their business to a successful exit. Iowa Startup Accelerator is powered by NewBoCo, a 501(c)(3) organization, and startups are funded by the ISA Fund I.